Ellie works primarily on the Migratory Connectivity in the Ocean (MiCO) System as the taxa lead for Marine Mammals and Seabirds. 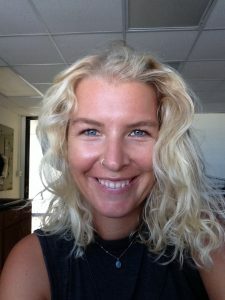 Ellie joined the Marine Geospatial Ecology Lab in September 2016 and has experience in marine mammal and seabird field research, geospatial ecology, and marine conservation. She also has experience with the collection, management, and analysis of marine acoustic datasets. Ellie’s main interests lie in animal migration, movement and behavioral ecology, and conservation solutions for the high seas. Outside of academia, her interests include sailboat racing, long distance cruising, beach volleyball, yoga, gardening, and music. She has dreams of sailing around the world and combining her love of sailing with marine conservation research. Prior to earning her masters degree in Environmental Management at Duke University, Ellie obtained her U.S. Coast Guard captain’s license and taught sailing, SCUBA diving, and marine science in the British Virgin Islands. She also spent nine months living aboard a research vessel sailing around the Indian Ocean examining cetacean distribution and conducting microplastic debris surveys. Before working for the Marine Geospatial Ecology Lab, Ellie was a research technician for Dr. Douglas Nowacek and still enjoys going out in the field on occasion with both the Read and Nowacek labs.